Summer may be winding down but Ray Dougherty already is preparing for next season at McKees Point Marina along the Youghiogheny River. The 200 docks are full to capacity, and the waiting list is growing, a stark difference from the 60 spots that were filled when Mr. Dougherty started as manager of the marina in McKeesport four years ago. 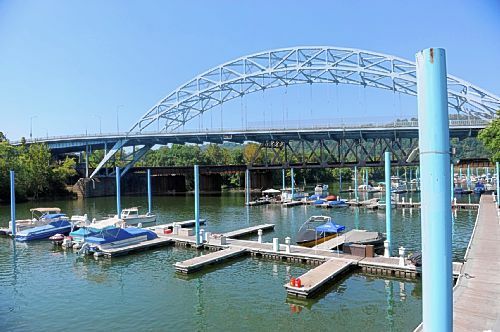 In addition to the solar, steel building he plans to have constructed along Water Street to house boats during the off-season using a $150,000 Growing Greener grant, growth at the marina also has led to a new boat dealer opening in McKeesport and increased revenues at McKees Cafe. He attributes the surge at the marina to reducing rates and adding entertainment. The marina hosts free, live entertainment every weekend. Rates were $1,080 annually for either a 30- or 20-foot dock in 2006. Now, they are $900 per year for a 30-foot dock and $580 per year for a 20-foot dock. Mr. Dougherty said he puts the docks in the water for the boating season to begin April 15 and takes the docks out when the season ends Oct. 15. The marina also docks 18 jet skis and keeps 11 spots open for transient boaters who can anchor at the space for $20 to $25 per day. “We keep those prices low to encourage people to come visit McKeesport,” he said. The marina is now self-sustaining — purchased with a $1.8 million Housing and Urban Development Authority loan in 1998 — and costs about $100,000 a year to operate, he said. By the beginning of next season, he wants to use marina revenues to build a small park for children near the marina for the families who dock there. He attributes the surge in family boaters to a slow economy and the other offerings of McKeesport’s waterfront — not the least of which is its use as a trail head to the Great Allegheny Passage, Steel Valley Trail and Youghiogheny River Trail. The combination of water traffic, foot traffic and boat traffic has boosted sales by 50 percent at McKees Cafe along Water Street, which Mr. Dougherty also manages. His cafe, which makes its own homemade bread and sells $5 lunches, has a nautical theme, including a large mural of sea life on the walls. Another wall is signed by boaters, bikers and hikers who have visited the trails from seven countries and all but five states. “We see a lot of bikers in the morning and boaters in the evening,” he said. Boaters who buy a yearly lease at the marina also have a membership to the McKees Cafe Clubhouse, where they can host birthday parties, graduation parties or other events for free. Mr. Dougherty said most members are from the Mon Valley or Westmoreland County, including the communities of McKeesport, North Huntingdon and Greensburg. The boating activity is why Pittsburgh Boat Sales opened on Water Street this summer and celebrated a grand opening a few weeks ago. “The McKees Point Marina has a central location to Pittsburgh, and we wanted to jump into the Pittsburgh market,” said Dino Ellena, service manager. “We noticed a growth in boating. Families seem to be forgoing a $7,000 vacation in favor of buying a boat and having many summers of vacation. And that’s great news, said Dennis Pittman, McKeesport city administrator. He hopes the city’s natural resources — as a confluence of the Youghiogheny and Monongahela rivers — will create other economic opportunities for the city. He’s making plans to build a fishing pier, establish a rowing club, partner with Penn State Greater Allegheny to construct a fish hatchery and develop the waterfront with small businesses. Seeking Hope VI grant money, he hopes to use those public funds to build a $100,000 fishing pier at 13th Street along the Youghiogheny River next year. When the Army Corps of Engineers is finished with its work on the Braddock Dam and eliminates the Elizabeth Dam, McKeesport will have a 20-mile pool of free-flowing water to use, doubling the 10-mile pool it has now. Those changes also will cause the Youghiogheny to rise about 5 feet, according to Mr. Pittman, making boating on that river a more pleasurable experience. Mr. Pittman also wants to see some rowing boats in the water within the next three years. He said the city has the space and desire for a rowing club that could host high schools, colleges and junior programs. He’s partnering with executives at Three Rivers Rowing to establish a program — possibly as a third site for the rowing club, which already operates facilities at Washington’s Landing and in Millvale. Mr. Pittman would like to see an indoor facility with a glass front built along the water in an old pipe yard. It could include a gym, boat storage and restaurant. He’s seeking public funds, philanthropic support and partnerships with the private sector. He declined to give specific figures while costs are being analyzed and collaborations are forming. He hopes a partnership with Penn State Greater Allegheny will lead to the creation of a fish hatchery at an old Westmoreland County water plant near 15th Street through the school’s agriculture program. Mr. Pittman said he is talking to John Hohman, plant manager, to work out a ground lease. It also may be donated to Penn State Greater Allegheny or the city, he said. “The elements are in place, but there’s still some work to be done,” he said. The economic impact of developing a waterfront and using rivers can be huge, according to Rick Brown, executive director of Three Rivers Rowing. It takes some work and money, but not necessarily much money, he said. Facilities range in costs, and sometimes boathouses start out with simple materials such as chain-link fencing, he said. Eight high schools, three colleges and a junior team representing 20 local high schools compete through Three Rivers Rowing. It has 400 adult members, 100 youth members and about 3,000 total participants a year. Mr. Brown is pleased that another local municipality wants to start a rowing program. “I think more rowing in the area would help all of us. We’ll be an area better served,” he said. And McKeesport would have more to offer, Mr. Pittman said. Visitors from Downtown to the North Side must now pass through a dark maze of cold, concrete underpasses. But the Children’s Museum of Pittsburgh will soon inject it with a bit of brightness. The museum is working with Norfolk & Southern Railroad and other groups to convert the railroad’s underpass on Federal Street near the post office into an outdoor art gallery. Work will start this fall and be finished in about a year. “The underpasses have long been a blighted barrier between the neighborhoods of the North Side and the amenities of the North Shore,” said Mark Fatla, executive director of the Northside Leadership Conference. The conference is working with the Urban Redevelopment Authority on another project to improve underpasses on Anderson and Sandusky streets. That involves new sidewalks, curbs and crosswalks. The gallery project involves cleaning and painting the Federal Street underpass, and installing lights and a metal mesh where works of art can be hung. The new color of the bridge and its columns has not been determined. The underpass gallery is part of the Charm Bracelet Project, which has encouraged two dozen North Side groups to work together. Among the Charm’s activities is free kayaking lessons on Lake Elizabeth with Venture Outdoors. The cost of the gallery is estimated at $300,000. The main contributors are The Heinz Endowments, NRG Energy Co., the Grable Foundation and the National Endowment for the Arts. Representatives from North Side groups will curate and coordinate the gallery project. Fatla said some North Side residents hope that the underpass projects will draw visitors to their neighborhoods. 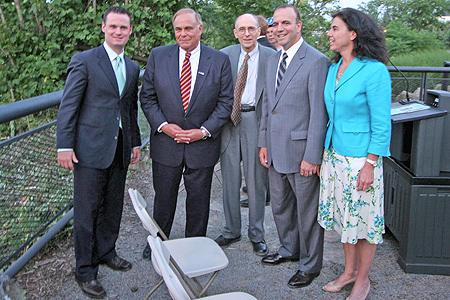 Governor Edward G. Rendell, accompanied by Mayor Luke Ravenstahl, activated the lighting of the portals of the Hot Metal Bridge, as it is commonly called today, at 8:15 p.m., Thursday, June 12, 2008. 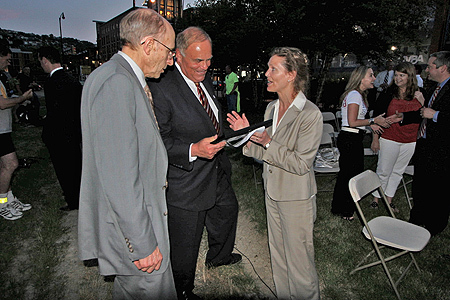 The ceremony took place at the Steelworkers’ Monument on the South Bank of the Monongahela River. 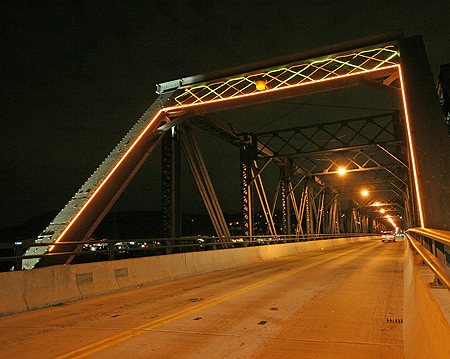 This was the third bridge decoratively lighted under the auspices of Pittsburgh History & Landmarks Foundation (Landmarks). The first was the Smithfield Street Bridge and the second was the Roberto Clemente Bridge. 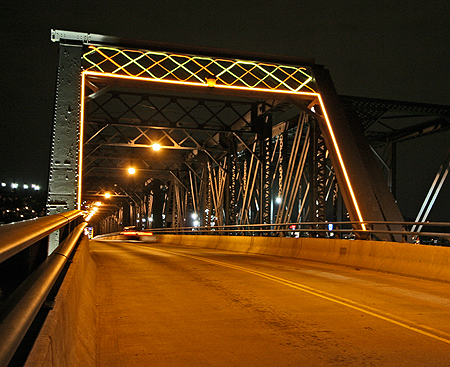 Actually, the portal lighting decorates the Main Bridge (Monongahela Connecting Railroad Bridge), constructed in 1904 and opened to motor vehicles in 2000. The Hot Metal Bridge of 1900 (opened to bicycles and pedestrians in 2007) replaced the original Hot Metal Bridge of 1887. 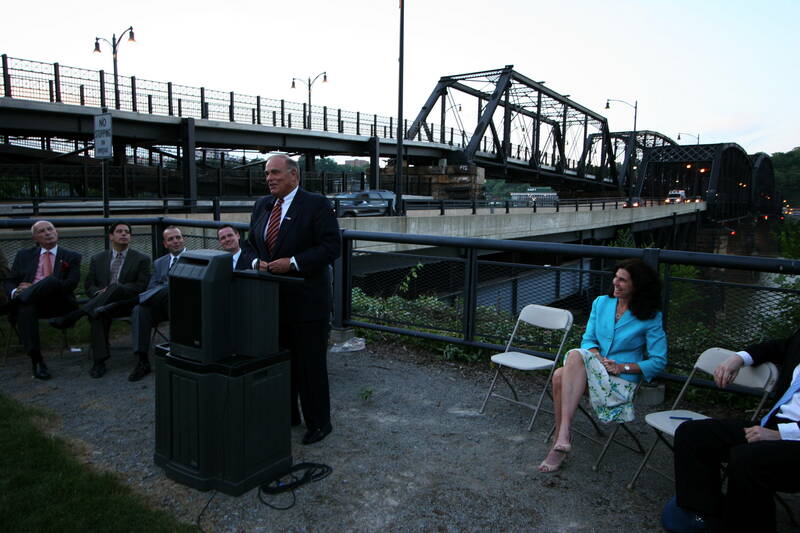 With the opening of Hot Metal Street in South Side Works, the name “Hot Metal Bridge” is now commonly used to refer to the historic bridge pair that is built on a shared set of piers. Historically, hot metal––iron just smelted in a blast furnace and still close to 3,000 degrees Fahrenheit—was transported in ladle cars from the blast furnaces on the north shore of Jones & Laughlin’s Pittsburgh Works across the Hot Metal Bridge of 1900 to the Bessemer converters and open-hearth furnaces of the South Side Plant. The Main Bridge of 1904 served the general purposes of the Monongahela Connecting Railroad, including the transportation of steel ingots and slabs. 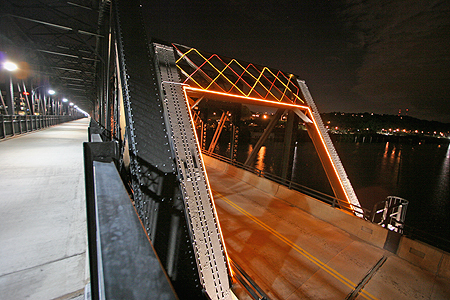 The bridge lighting is LED tubular lighting in orange, red, and yellow, suggesting the colors of the hot metal and steel slabs that were once transported across the bridges. 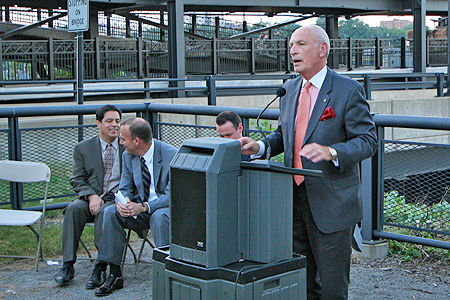 Grenald Waldron Associates of Philadelphia designed the lighting for the bridge as they did for the Roberto Clemente Bridge. Courtney Sarge was the principal designer. Funding for the project came primarily from a grant from the Department of Community and Economic Development at the Governor’s request. That grant totaled $125,000. Design of the lighting was financed by grants from the Soffer Corporation, the International Brotherhood of Electrical Workers, Wellington Power, and Landmarks totaling $12,500. Landmarks also underwrote an additional $15,000 of costs for the project, bringing the total to approximately $150,000. 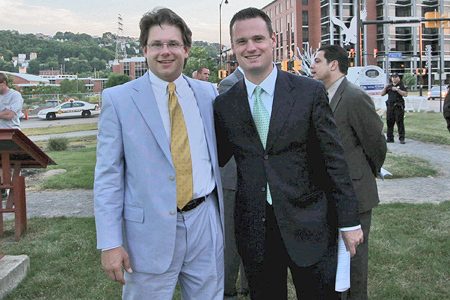 Mayor Ravenstahl pointed out, “This is another fine public-private accomplishment in our goal to make Pittsburgh a uniquely attractive city by capitalizing on our historic assets. We thank the Governor and Landmarks and our city team for bringing about this excellent result. Mark Bibro, Chair of Landmarks, said, “We are grateful that we have a governor who understands the significance of lighting these great engineering monuments to promote their continued use and increase tourism. We are the ‘City of Bridges,’ with 446 bridges (based on the most recent count) within the City limits, and hundreds more throughout Allegheny County. We must continue this lighting program. Founded in 1964, the Pittsburgh History & Landmarks Foundation works to identify and save architectural landmarks; revitalize historic neighborhoods; and instill community pride. Visit www.phlf.org or call 412-471-5808 for information about preservation services, educational programs, and membership benefits. 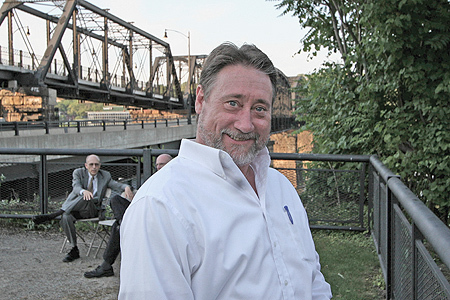 For Mark Bibro, the Hot Metal Bridge is more than a way to get to opposite shores of the Monongahela River.The Pittsburgh History & Landmarks Foundation chairman says it’s a symbol of Pittsburgh’s industrial past, and a connection point for the city’s future in research jobs and riverfront redevelopment. Illuminating the bridge Thursday night was another sign of the changes Pittsburgh continues to make as it reinvents itself. Gov. 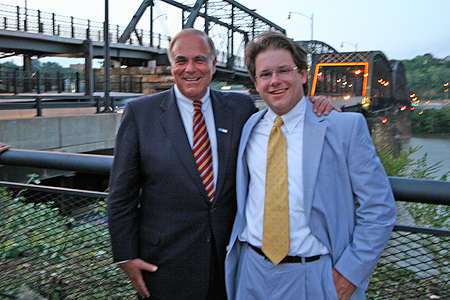 Ed Rendell told electricians to “light up the bridge” by its South Side exit, and red, yellow and orange lights turned on, completing a $150,000 Pittsburgh History & Landmarks Foundation decorative lighting project on the century-old bridge. 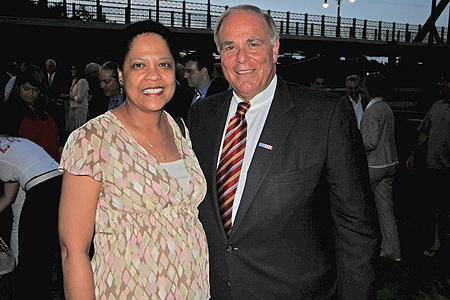 Cities are built on feeling as much as substantive measures like improved schools and balanced budgets, Rendell said. Illuminating bridges like the Hot Metal Bridge shows how Pittsburgh continues to renew itself, he said.Anthony Owens, 42, of Overbrook stopped his bike ride to watch the ceremony. After years away from his hometown, he returned to Pittsburgh in 2004 and couldn’t believe how the South Side’s shore had changed from steel mills into a retail spot. Lighting the bridge was a validation of the transformation, he said. The colors on the bridge are supposed to represent the liquefied metal that once traveled on the Hot Metal Bridge. Ladle cars took the molten metal from Jones & Laughlin Steel Corp. blast furnaces on the Monongahela’s north shore to south side open hearth furnaces. Now, people on foot, on bicycles and in cars travel to the SouthSide Works living, dining and entertainment center. “Today, ideas are transported across this bridge via young people on bikes,” said Christine Fulton, vice president of external relations for Soffer Organization. 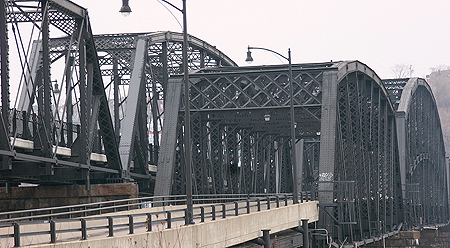 The Hot Metal Bridge connects SouthSide Works at South 29th Street to Oakland’s Second Avenue and spans 321 feet and 4 inches from bank to bank. It crosses the Monongahela 3.1 miles upstream from Point State Park’s fountain. 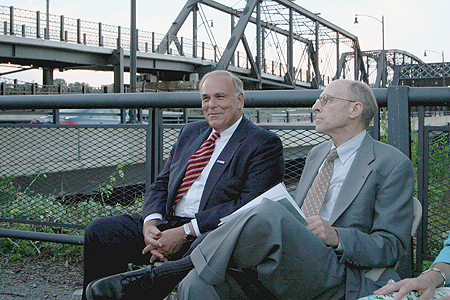 Using the bridge makes good use of an artifact from Pittsburgh’s smoky steel-based past, History & Landmarks Foundation President Arthur Ziegler said, while the city progresses toward pushing service industry growth and riverfront redevelopment. The incandescent tubular lighting trims the entryways of the vehicle bridge, which was originally the railway bridge. The adjacent bridge actually was the crossing used to carry molten metal between facilities, but the twin spans now are commonly referred as the Hot Metal Bridge. The bridge opened two lanes to vehicles in 2000. 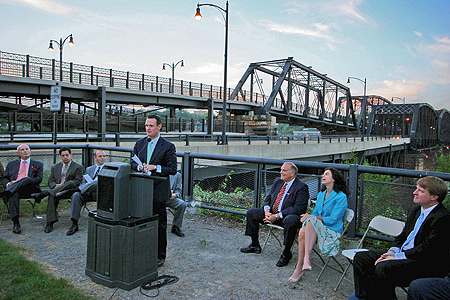 In 2007, the downstream bridge was opened for pedestrian and bicycle traffic. 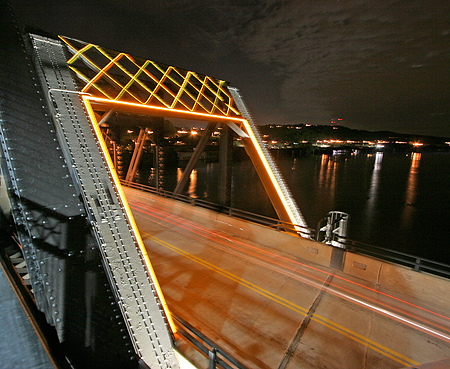 The Pittsburgh History & Landmarks Foundation previously lit the Smithfield Street Bridge and the Roberto Clemente Bridge decoratively. Pittsburgh has 446 bridges, more than any other city in the world. Thirty span a river. F.A. Krift can be reached at bkrift@tribweb.com or 412-380-5644. 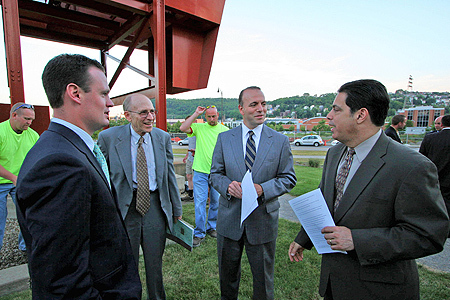 Pittsburgh History & Landmarks Foundation, Governor Edward G. Rendell, and Mayor Luke Ravenstahl invite you to join us in lighting the portals of the historic Hot Metal Bridge, which spans the Monongahela river at the South Side Works. Meeting Location: Meet at the South Side Works at Hot Metal Street and the Hot Metal Bridge at the Steel Worker’s Monument ont he south bank of the Monongahela River. For many at California University of Pennsylvania, it may seem like the changes of every semester include a new construction project on campus. Whether it’s been the demolition of Binns Hall, Longanecker or Duda Hall, the construction of Carter Hall, Booker Towers and the new Duda Hall, or the renovations of Steele Hall, Vulcan Hall and now Herron Hall, changes have become a part of life for many students, faculty and staff. Even though the campus landscape has drastically changed over the last 10 years, a new grant now backs a project in the works that will help preserve the university’s heritage in the years to come. The $200,000 grant from the Los Angeles based J. Paul Getty Foundation was awarded to the Pittsburgh History and Landmarks Foundation last summer, which will be distributed to preservation projects on the campuses of Seton Hill, Washington &amp; Jefferson and IUP, along with Cal U. Work on the project started last October, as team members focused on historical research for all four college campuses. The team has already completed some work on California University’s campus, and will continue their visits over the summer and into the fall semester. As the ‘conservation team’ continues their work on plans to maintain local history on the ever-changing Cal U campus, Eugene Matta hopes that campus-community members will speak out on their opinions and ideas. The Pittsburgh History & Landmarks Foundation is tackling another building rescue project in Market Square, with the aim to further a transformation already under way in the historic Downtown public square.The South Side preservationist organization announced today it will take on restoration of the Thompson Building, a three-story structure adjacent to a trio of vacant buildings where it is spending about $2.5 million to convert into a mixed use complex known as Market at Fifth. Acquisition of the building will enable the foundation to expand its complex into that structure. Plans for 439 Market St., 441 Market St., and 130 Fifth Ave. include a ground-level restaurant or retail store, seven upper-floor apartments and a rooftop garden. In addition, the foundation also announced it was given an “easement in perpetuity that will protect the architectural quality of the Buhl Building, another structure on Fifth Avenue near Market Square.As reported, eight new shops have moved in — or will in the coming months — further rejuvenating the 224-year-old square. Businesses there have credited an increased police presence to fight crime, reduce panhandling and efforts to clean up the city’s streets. More recently, new programs have been introduced, such as the Pittsburgh Downtown Partnership’s Paris to Pittsburgh program that is providing matching grants to help restaurants and other merchants renovate their buildings and expand their operations onto sidewalks — similar to venues popular with tourists in the French capital. Ron DaParma can be reached atrdaparma@tribweb.com or 412-320-7907.